Nun Sues Krishna-Unproven! - Truth or Fiction? 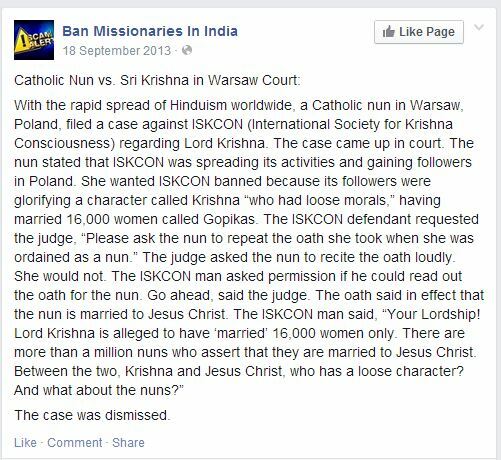 This is a rumor alleging that a Catholic nun in Warsaw, Poland filed a lawsuit against the International Society for Krishna Consciousness because they follow Krishna who the nun said “had loose morals” because he had 16,000 wives. The rumor goes on to say that the case was dropped by the judge because millions of nuns were alleged to be married to Jesus. TruthOrFiction.Com has found no evidence that there was any case filed by a nun in Warsaw. This story does have all the makings of an urban legend. In all of the samples that we found on the Internet important facts were missing from the story. The eRumor was missing a first hand account, lacked names of the people involved and had no accurate date as to when this allegedly occurred. With the rapid spread of Hinduism worldwide, a Catholic nun in Warsaw, Poland, filed a case against ISKCON (International Society for Krishna Consciousness) regarding Lord Krishna. The case came up in court. The nun stated that ISKCON was spreading its activities and gaining followers in Poland. She wanted ISKCON banned because its followers were glorifying a character called Krishna “who had loose morals,” having married 16,000 women called Gopikas. The ISKCON defendant requested the judge, “Please ask the nun to repeat the oath she took when she was ordained as a nun.” The judge asked the nun to recite the oath loudly. She would not. The ISKCON man asked permission if he could read out the oath for the nun. Go ahead, said the judge. Some Motel 6 Will Only Rent Rooms To Those 21 and Over-Truth! Obama Announces Plans For A Third Term Presidential Run-Fiction!